Conceptual Yoda as pictured in a German ad. 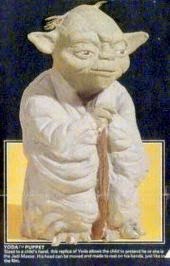 For years the original conceptual prototype for the Yoda Hand Puppet had only been known through images featured in promotional material like catalogs. I wrote an Archive entry for it way back in 1997. Usually, it's safe to assume that stuff like this no longer exists. Handmade models and the like simply don't turn up with any regularity. For instance, none of the conceptual models for the original 12 figures have surfaced, even though they'd surely be worth thousands of dollars a piece in today's market. It came as something of a surprise, then, when someone named Robert Short posted on Facebook back in July claiming to own the original Hand Puppet model. He also claimed to be the creator of the prototype. There's not much much doubt that his claims are true: He even posted a vintage photo of himself holding the valuable prototype. The fascinating thing about his story: Short worked for Lucasfilm rather than Kenner. According to the details posted on Facebook, at the time he created the prototype he was working on costumes and dressing up as C-3PO for advertisements. Apparently, Gary Kurtz saw his work on the Yoda, and then presented it to Kenner, which licensed the idea for their toy line. 20-plus years collecting this stuff and that's the first I've heard of a Lucasfilm employee creating a Kenner toy prototype. Fascinating stuff! This information coming to light raises some interesting questions. For instance: Where do the Yoda puppet prototypes with the vinyl heads and cloth bodies fit into the toy's developmental timeline? Did Kenner ditch the cloth-bodied version when Short's concept was presented to the company? Or were the two ideas being worked on concurrently? Also: How does the infamous Talking Yoda fit into all of this? 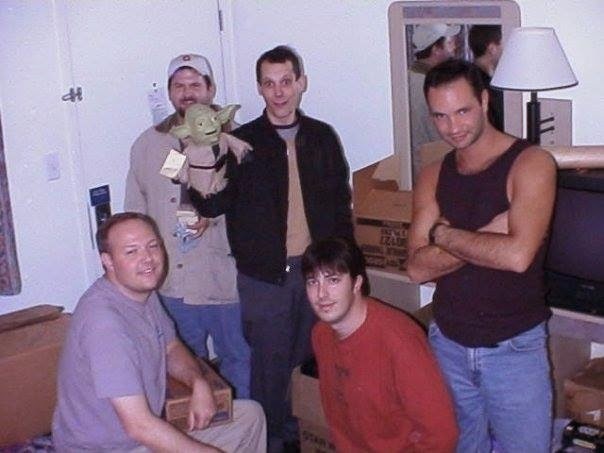 For many years the cloth-bodied Yoda puppets were taken to be Talking Yoda prototypes. However, that theory was put to rest upon the surfacing of this item, which is clearly marked as a puppet. Might both prototype versions of the Hand Puppet be evolutionary offshoots of the Talking Yoda? Or do the Talking Yoda and the Hand Puppet Yoda derive from distinct concepts? Rotocast head for puppet prototype. Electroform mold for puppet prototype. Prototypes related to Talking Yoda. Special Feature on concept models.